Giacomo Puccini’s story of love, betrayal, power and corruption is portrayed in a straightforward, yet dramatic illustration by the Welsh National Opera in this accessible and enjoyable performance of Tosca. Depicted in a classic style and set in the time of Napoleon’s invasion of Italy, the tale begins in an atmospheric church, where painter Mario Cavaradossi (Gwyn Hughes Jones) works on a picture of Mary Magdelene. He is interrupted, first by Angelotti, an escaped political prisoner and old friend, whom he agrees to assist by helping him hide from menacing villain, Baron Scarpia (Mark S. Doss). 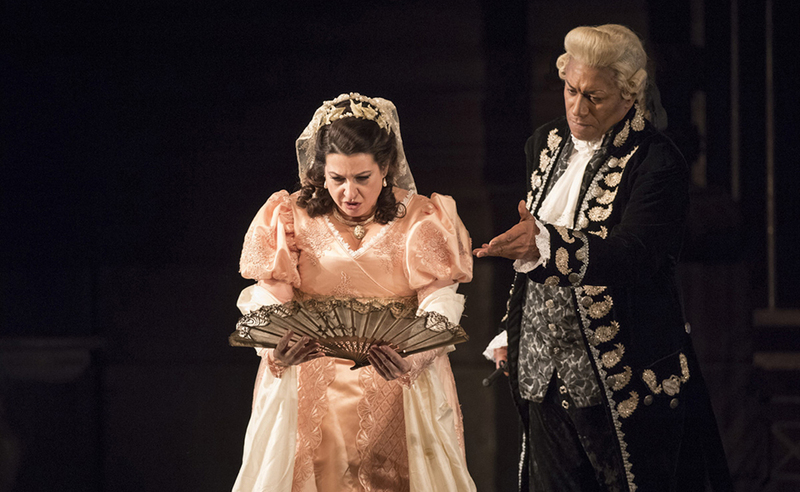 As Cavaradossi ushers Angelotti away, he is interrupted again by his jealous lover, Tosca (Claire Rutter). As the story unfolds, we see Scarpia manipulate Tosca and interrogate and torture Cavaradossi in an attempt to find the escaped prisoner and extort Tosca’s love. The plot rapidly develops through the three acts, culminating in a tragic, theatrical end. Claire Rutter conveys Tosca’s jealous, suspicious side with conviction and empathy, tinged with a touch of humour, as the opening scenes depict her and Cavaradossi singing of their love for one another. 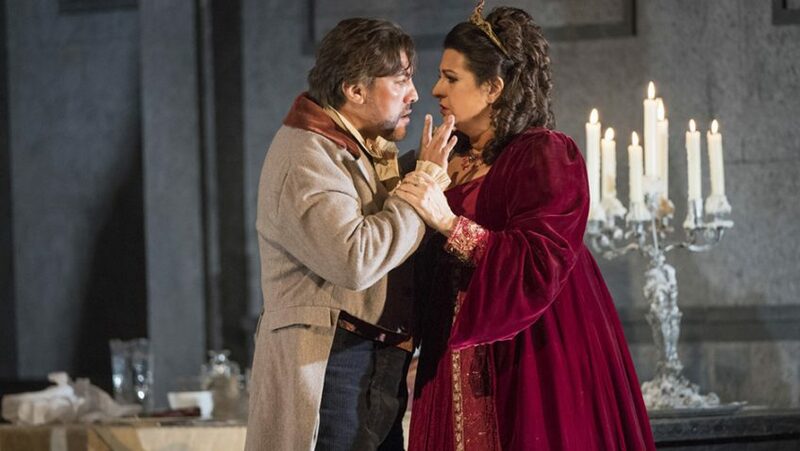 This presents an affecting contrast to later scenes when Rutter exudes emotion as the punishing portrayal of power verses powerlessness is played out between Tosca and Scarpia; Tosca wrestles with the impossible conundrum of how to save her lover, and herself, from the clutches of Scarpia. Gwyn Hughes Jones fills the stage with ease, humanising Cavaradossi with well-timed looks and a clever depiction of the comic bickering between Cavaradossi and Tosca that sets both up as sympathetic, likeable characters and paves the way to heighten the tragedy that awaits the lovers. Mark S. Doss portrays the foreboding, scheming villain of Scarpia with depth and power. 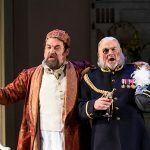 His secure baritone complimented his successful performance as the stock rogue and prompted some appreciatory boos from the audience when he took his bow. The orchestra was brought to life by conductor Carlo Ricci, who was lively, animated and drew out the rich tones of the score with charisma and precision. He amplified moments of tension and subtly allowed for spontaneous applause with impressive, yet gentle, control. The WNO Orchestra deserve much credit for their moving delivery of Puccini’s stirring repertoire. The three acts were each home to uniquely impressive sets. The grey chill of Scarpia’s apartments in the Palazzo Farnese in Act 2 provided a chilling backdrop for his manipulation of Tosca and the pained groans of the tortured Mario that rang out from behind the scenes. The attention to detail, with rich furnishings and a grand, aged wooden table laden with a lavish-looking ham and other gluttonous goods, assisted Doss is portraying Scarpia’s power and dominance. The stony, mighty battlements of the final act were set against a creeping, red sunrise; a subtle suspense-builder as the clock ticked towards Mario’s last moments. 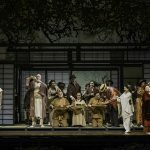 This is a splendidly staged opera with impressive performances from both the stage and the pit. 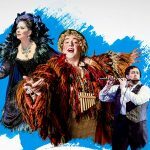 It is highly recommended for the seasoned opera-goer, but, with its recognisable arias and fast-paced storyline, is also accessible and enjoyable for any novice who’d like to dip their toe into the wonderful world of the opera.